Tuesday 2'sdays - Buy One Get One Free on Pizza at Pizza Hut Delivery Only valid on Tuesdays. Pizza from €7 at at Mizzoni Pizza & Pasta Co.
With $600 borrowed from their parents, brothers Dan and Frank Carney opened the world’s first Pizza Hut in 1958 in Wichita, USA. The brand soon spread worldwide and today there are over 15,000 branches across the world, with a name so big its adverts have featured Ringo Starr, The Muppets and former Soviet Union President Mikhail Gorbachev. Now thanks to Pizza Hut Delivery, Hut fans can enjoy the amazing taste of its pizzas from the comfort of their own home. Your absolute favourite pizzas are here, from the minimalist Margherita to the fruity Hawaian, sumptuous Pepperoni Feast and veggie-friendly Vegetable Supreme. 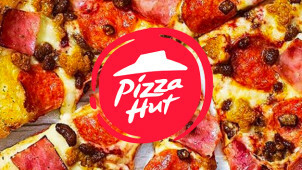 But it’s in the customisation that Pizza Hut truly comes into its own: you can select from different bases to get something thin and crispy; thick and cheesy or even stuffed with hot dogs. Then you can choose to add extra cheese or sauce, different meats and more veg. The very best part is that it’s all coming straight to your door so you barely have to lift a finger! How do I use my Pizza Hut Delivery vouchers? Check out Pizza Hut’s facebook group for some great offers! Where is my nearest Pizza Hut Delivery? You can search for your nearest store here. Where can I find nutritional and allergen information for Pizza Hut Delivery? Can I amend my Pizza Hut Delivery order? With enough time, yes. Phone your local Hut to see if this is possible. Where does Pizza Hut Delivery source its eggs? Pizza Hut is ensuring all of its eggs will be from cage free sources by 2020. This depends on which store you’re contacting. If you wish to cancel, contact your local hut as soon as possible. Opening times vary from shop to shop. You know the feeling: it’s late, you’re slumped on the sofa and the telly’s too good to miss. Cooking dinner just won’t cut it. There’s only one solution and its name is Pizza Hut Delivery. With its trademark herby base and mouth watering cheese and tomato sauce, it’s pretty unbeatable staying-in food. Use our Pizza Hut Delivery vouchers and you’re sure to make a saving on something cheesy and delicious. Just remember to save room for sides and dessert! Mizzoni Pizza & Pasta Co.
You can customise all of the pizzas for delivery to ensure your order is exactly the way you want it — from choosing the thickness of your base to the level of your cheese, the flavour of your sauce and the many different toppings available. With all kinds of meat and veg on offer, you can have your meal your way. You can even split your pizza into halves and have different toppings on each side for double deliciousness. It’s not just the pizzas we love, it’s the delicious desserts that round off your meal with style. From cookie dough to mini doughnuts and chewy brownies, we promise you’ll be in sugar heaven. Order with a Pizza Hut Delivery discount from vouchercloud and your treats could cost you less, leaving you with more room in your wallet (though not much room in your belly). There’s even Ben & Jerry's ice cream too!